Mr Ezarraf's work is hard to categorise. On an orange and blue screen, figures turn and run. Some look as if they’re throwing something – but the figures are overlaid over each other, so it’s difficult to make them out. They are running, but at the same time, they are floating on a lunar plane. I’m viewing the work of Moroccan artist and poet Noureddine Ezarraf and speaking to him about his practice. Mr Ezarraf’s work is multi-disciplinary, contemporary and not easily described. 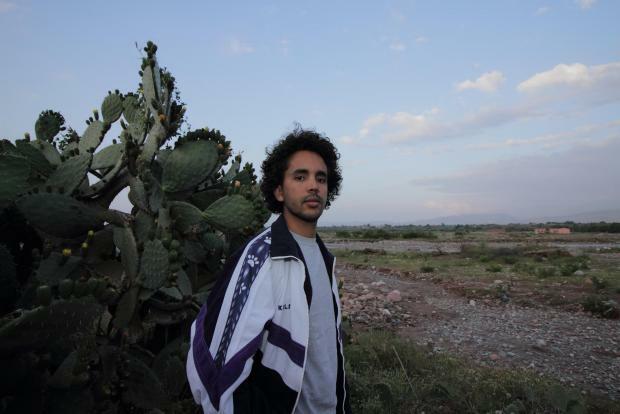 As an economics graduate, he examines power dynamics, identity politics and forms of dialogue through performance and video work, working in his native Morocco, but also in Spain, and more recently, in the UK. His work includes the collecting and archiving of social media videos uploaded during the so-called ‘Arab Spring’, as well as performance works in public spaces. He enjoys talking theory and experimentation. I ask him what it means to be an artist - particularly a contemporary, multi-disciplinary artist - in his country. He says his practice places him outside familiar models of how are artist should behave and gives an example of the figure of a poet in a village; a familiar figure, using a familiar form of art. Mr Ezarraf himself certainly does not fall within this definition; his work places him firmly outside the familiar, to local audiences, as well as local authorities. This brings us to discuss the role of the artist and of public art in society. The ‘publicness’ of performing in a public space, even just the act of reading poetry out loud, in a public space can be a politically-charged act in itself. Mr Ezarraf speaks about the importance of the ‘gesture’ of a work of art; whether it be an archiving process, a public work, or the process of struggling with bureaucracy to produce a work. A few months ago, Mr Ezarraf travelled to London to participate in an exhibition and reflection-project on the poetics and policies of hospitality. He speaks of the irony of having to apply for a visa and go through the visa process while participating in such a project. Information is gathered, biometric date is recorded, a profile is drawn, all in return for permission to enter a country. Does this process negate the artistic act? Or is participating in the project and going through a visa application process a political gesture in itself? Is it, therefore, a part of the artistic work? To Mr Ezarraf, the distinction between art and its context is blurred. He is constantly curious about his surroundings and interested in understanding his environment; his practice is an exploration of how the world works politically. Art, for him, means taking part in a political ecosystem – it is a form of communication. Creating art in a public space requires a transformation of the body from the personal to the political; in a public space, the body becomes public property, open and vulnerable to the public gaze. His recent project, Eaux Incendieres, recently exhibited in Brussels, is an archive of videos taken during the political uprisings in northern Morocco and more broadly the Arab Spring. In this project, Mr Ezarraf combines and manipulates footage that were disseminated through social media during this time. He talks about the temporal importance of these images; how they contributed to political uprisings in many countries, but also how short-lived they were by their very nature. Video work itself is temporal, and, in a way, self-renewing. The video ends and the image fades but after a moment of loss and mourning, it reappears and continues anew. As a visual artist, this use of the visual – the still or video image – holds a special significance for Mr Ezarraf, particularly in relation to democracy and accountability. The eye and the act of looking, he says, is objective, and demands visual evidence; as opposed to listening, which relates more to obedience and allegiance. Social media can further universalise this visual accountability, and when used democratically, can provide a synchronisation of a common search for truth. When we speak about Malta and the Mediterranean, Mr Ezarraf tells me how important he feels dialogue is in this part of the world. He describes the Mediterranean as a sort of common borderline, between all the countries and cultures that share its shores, and artists, he says, have the potential to create a new form of dialogue between cultures. Whether it’s through performance in public space, video art, or through straightforward conversation, it is intercultural dialogue that might somehow carve a way forward in these times of disquiet. Noureddine Ezarraf will be in Malta to participate in Rotot: Mediterranean Routes through Intercultural Dialogue, co-hosted by Inizjamed and the University of Malta, to take place on 27 March at Palazzo de la Salle, Valletta.